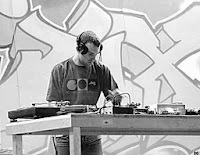 RjD2 is an American hip-hop producer who makes largely instrumental records that eschew the trend of employing brand name all-singing pop stars to boost sales. After starting his music career when his dance teacher mother supplied him with the cash to purchase some used turntables off a friend, RjD2 has become the thinking person’s hip-hop producer of choice. He’s so highly regarded that the clever guys at AMC decided his track A Beautiful Mine would be the ideal music for the opening of Mad Men. The title Her Majesty’s Socialist Request may have derived some inspiration from America’s current Tea Party belligerence towards Obamacare (one can hear aggressive capitalist chants of “buy” and “sell” masterfully laced around jolting breakbeats), but this tune is classic US hip-hop to a tee. The video is among the very best of 2013―something that is perhaps a tribute to the dance-loving mother who nurtured RjD2’s love of music and movement. If this is what socialism sounds like then America deserves more it.